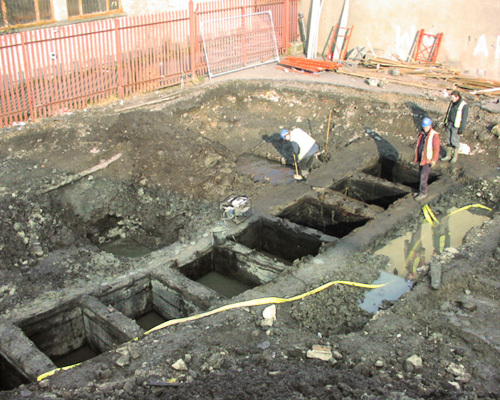 Following a comprehensive site investigation and assessment of a former Tannery and consultations with both the client and regulatory authorities, a remediation proposal was agreed. A subsequent remediation programme was implemented dictated by the level of contamination risk and the proposed redevelopment for mixed commercial and residential use. Contamination included heavy metals and large quantities of fuel oil. Verde were contracted to undertake a site assessment following the discovery of large quantities of oil at a development site in Dublin, Ireland. Extensive site investigations were undertaken to determine the nature and extent of contamination present. Contamination encountered in soil and shallow groundwater included Chromium and fuel oil. A remediation options appraisal was undertaken and a remediation programme involving demarkation of grossly contaminated soils for off-site treatment and re-engineering of uncontaminated material for reuse. A total of 1000m3 was contaminated material was removed to a licensed treatment facility in compliance with Waste Management Acts 1996-2003. Implementation of in-situ carbon filtration systems to treat affected groundwater, including installation of Interceptors. Kilcoole,Co. Wicklow, A63 KV04, Ireland.